Were it not for the noticeboard just before the wooden gate, there is nothing to suggest this field is going to be any different from countless others we have wandered in and around. It tells us we are about to enter such a rare habitat there are only 22 hectares left in the U.K. I must confess I had never heard of squill-spurge fescue grassland before reading the sign. Thinking of rare habitats, I had always assumed they were endangered tracts of land in foreign exotic climes, places I would probably never visit before they died out completely. 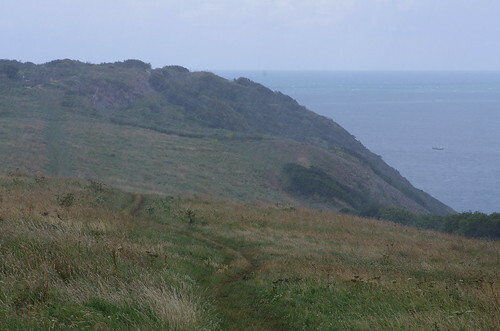 It's hard to believe we have one virtually on our doorstep and apart from a handful of other sites around Torbay that it is found nowhere else on earth! But as the sign explains, such a specialist habitat has to be carefully managed to maintain the precise balance required. 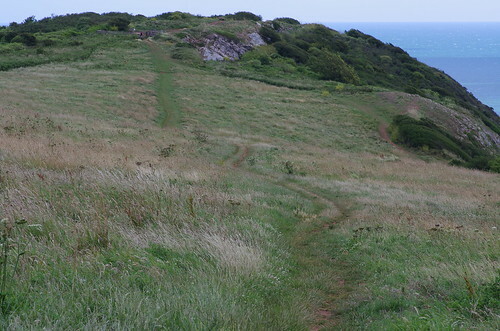 Cattle graze in the meadow at certain times of the year and further down on the cliffs, as part of the "Loving Our Limestone" project, rangers from Torbay Coast and Contryside Trust have been working to keep invasive scrub species at bay, thanks to a grant by the SITA Trust. 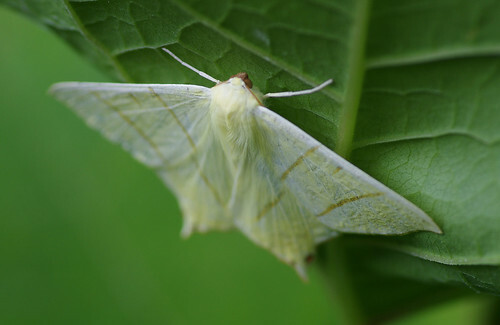 We have barely got out of the car when we have an immediate stroke of luck: there hiding on the underside of a Japanese knotweed leaf is a Swallowtail Moth. It's alarming how much the Japanese Knotweed has encroached and spread since our last visit. I remember seeing on the news last year about a pioneering project to introduce a pest that acts as a control agent on the plant in its native Japan. Tests were being done to ascertain if the insect (known as a psyllid) posed any threat to indigenous plant and insect life in the UK. I can't help wondering if these tiny insects will be introduced here to stem the tide of the knotweed invasion. Before and after - while the Meadow Browns had sensibly taken cover we were left exposed to the elements. 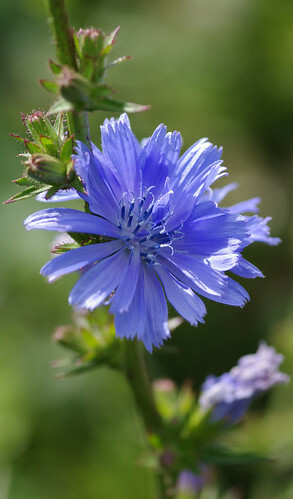 Thankfully, on the return journey conditions cleared and the wind dropped sufficiently to allow some chicory flowers to be photographed. This site used to be a dumping ground many years ago but now in the meadow many wild flowers thrive. I look forward to returning soon to see what other species we can find.